A flexitank is a liquid bulk package which stores and transports non-hazardous liquid products safely. Created by the United States military in the 1960s to transport and store diesel, the Flexitank has evolved for non-hazardous liquid transport. Construction materials include polyethylene for package cover and layers (a durable thermostatic polymer). Kan-Haul provides freight and shipping excellence through cost-effective and safe practices. The use of bulk liquid tankers such as flexitanks puts Kan-Haul on the map for elite shipping needs. Flexitank transportation saves the shipper time and cost. There are fewer pain points to manoeuvre. This liquid bulk package saves on positioning costs compared to ISO tank containers. Handling, filling and unloading labor costs are reduced compared to IBC’s and drums. 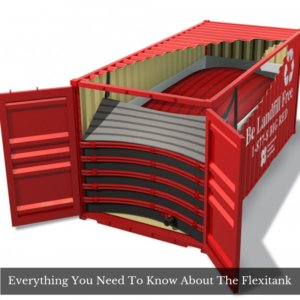 A flexitank holds 15% more cargo capacity than IBC’s, and holds 40% more cargo capacity than drum storage, using the standard 20’ft shipping line container. Real cost-effectiveness is seen if a shipper can just pay for the bag and flexitank surcharge to the carrier. The shipper will also pay just one-way freight costs. No container has to be returned with fees. These loaded bulk practices really do reduce individual packing requirements and shipment costs. The shipper can use flexitank transporation to convert standard 20ft’ ISO Containers to a liquid container. Cubic capacity ranges from 16,000-24,000 litres. Flexitanks are manufactured to ISO9002 standards. Using flexitank transportation shows flexibility and availability factors not seen with bulk liquid transportation units. These bulk units must be continuously cleaned before shipment, slowing availability for shippers. Flexitanks can be shipped worldwide within days, not weeks – that time advantage eliminates pain points. In the words of a satisfied flexitank user: “One of the things I saw today was the unloading of a 25 000 litre flexitank which had been shipped to France from Chile. This is now the standard way of shipping wine: a 25,000 litre flexitank is like a huge bag-in-box – it’s a single-use skin that’s placed inside a standard shipping container and is filled with wine. When it reaches the port, it’s loaded onto a lorry and then at the bottling facility it is transferred to tank, ready for bottling. Flexitanks have been in use for a number of years in the wine industry. It is the most economical way of transporting wine or other liquids over any distance. The cost of sending an equivalent amount as finished case goods would far exceed that of the bulk liquid, not to mention the extra space necessary. The industry has been “green” in this respect before it became the buzz word. Cheers” – jamie goode’s wine blog. Kan-Haul has been a part of the bulk liquid transport business for the last three decades. With safety and cost considerations as a concern, contact Kan-Haul for flexitank transport.